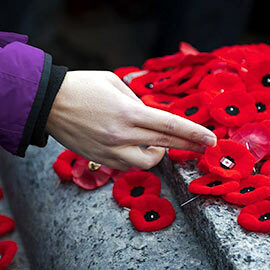 All members of the Laurier community are invited to commemorate Remembrance Day during ceremonies on Friday, Nov. 10 and Saturday, Nov. 11 at a number of locations on or around Laurier’s Waterloo and Brantford campuses and Toronto office. The Laurier History Students’ Association (HSA) will be hosting a Remembrance Day ceremony in the Concourse Friday, Nov. 10 starting at 10:40 a.m. Speakers will include members of the HSA; Roger Sarty, a history professor and former historian with the Department of National Defence; and David McMurray, vice-president: Student Affairs, who will read In Flanders Fields. Fall Open House at the Brantford campus is scheduled for Saturday, Nov. 11. Poppies will be distributed to campus visitors and events will pause for two minutes of silence at 11 a.m. In uptown Waterloo, a parade will march from St. John’s Church parking lot at 22 Willow St. to the cenotaph on Regina St. between 10:15 and 10:30 a.m., with the ceremony getting underway at 10:30 a.m. In Kitchener, the Remembrance Day ceremony will be held at Carl Zehr Square (200 King St. West). Members of Branch 50 of the Royal Canadian Legion will be performing a special “Drumhead Service,” beginning at the clock tower in Victoria Park where the parade will form at 10:15 a.m. and “step off” to begin the march to City Hall at 10:30 a.m. The procession should arrive at Carl Zehr Square by 10:45 a.m. where the drumhead service will be performed. The City of Brantford’s Remembrance Day ceremonies will be held at the Cenotaph at the corner of Brant Avenue and Dalhousie Street at 11 a.m. The parade and a walking march will leave Harmony Square at 10:45 a.m. en route to the Cenotaph. More details on Remembrance Day ceremonies in Brantford can be found on the City of Brantford website.